Since the 1940s, we have known that gibbons use a secret language to communicate, but only now, with ultra sensitive equipment, have scientists been able to decipher their unusual calls. This research could give us clues to the evolution of human language. 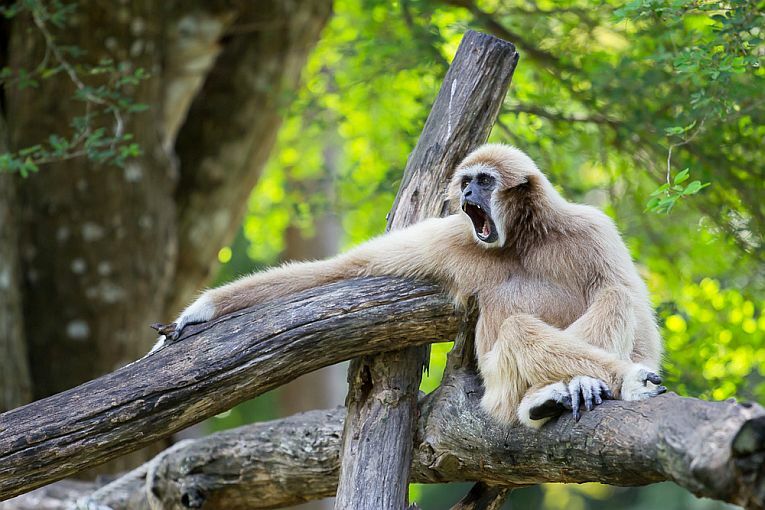 Lar gibbons, or the white-handed gibbon, are an endangered primate, usually found in Thailand, Laos or Malaysia. Every morning, the gibbon family gathers at the edge of its territory, and sings out a ‘great call’, a duet between the breeding pair, each pair exhibiting a unique variation of the family song. Lar gibbons can produce sounds so soft that they can’t be easily heard by the human ear. Scientists from Durham University have managed to record these calls by spending four months following them through the forests of North-eastern Thailand, and they have published their analysis in the BMC Evolutionary Biology journal. …lar gibbons are able to generate significant, context-dependent acoustic variation within their main social call, which potentially allows recipients to make inferences about the external events experienced by the caller. This reminds me of the giraffe and its language. There is so much about the animal kingdom to discover. So fascinating! Thank you. I don’t know anything about giraffe language! Thanks for that, will have to investigate!